Professional learning never stops, and for Knox County’s third through sixth-grade teachers, it was available on-demand. The topic was “On Demand Writing Prompts” for attendees on Tuesday as they learned from experts Abell and Atherton. Sylvia Abell brought a wealth of classroom and training experience to share with Knox County. With 27 years as a highly effective English teacher for Butler County High School and adjunct faculty member for WKU, seven years’ experience as co-director of the Western Kentucky University Writing Project, and three years as a Writing Consultant for the Kentucky Department of Education, she has, for the past ten years, provided quality professional development for thousands of Kentucky teachers and administrators. Co-presenter Debby Atherton held successful positions as an elementary, middle, and high school principal before retiring and going on the road to support teachers. Before her tenure as principal of Bullitt East High School, Ms. Atherton served as a Director of Secondary Education, a District Assessment Coordinator, and Regional Science Consultant for the Kentucky Department of Education. Ms. Atherton was honored with the Louisville Writing Project’s Patrona Award for her support of the teaching of writing. Teachers in attendance agree with Imel, citing the tools and resources that they will be able to take back into their classrooms. 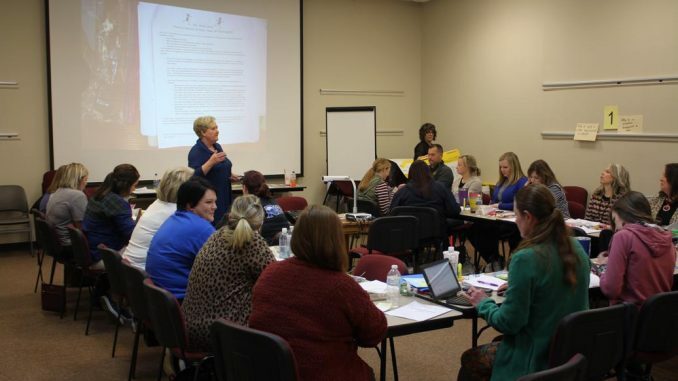 Activities planned by Abell and Atherton allowed the teachers to discuss characteristics of effective writing through the analysis of paragraph structures. Teachers are challenged to go back to their school and share what they learned through professional learning communities and one-on-one discussion.